Schaerer USA Corporation was a joint venture between the Eckenhausen brothers and the Swiss manufacturer, M. Schaerer AG. Since opening our doors in 1993, we have placed over 45,000 espresso machines and established a national presence with over 450 service centers in all major metropolitan areas. Located in Signal Hill, California our warehouse always holds a buffer stock of machines and parts. This prevents having to wait weeks or sometimes months for parts to arrive from Switzerland. This also means that our customers don’t have to struggle with time zone difference and possible language barriers. With our company's Swiss roots, we know and emphasize well-engineered products. Meanwhile, our American customers demand excellent customer support so we make sure every machine meets exact standards and is supported by a national service network. Our customers benefit by having access to quality Swiss equipment while retaining local service. Our parent company was originally founded as a manufacturer of medical equipment in 1892. The precise requirements of that industry and the usage of hot water and steam generators to sterilize equipment was the perfect starting point to expand into the espresso equipment business. The constant drive to innovate led Schaerer to introduce its first fully automatic coffee machine in 1970. This committed Schaerer to invest heavily in its research and development which helped place the company at the leading edge of technology. 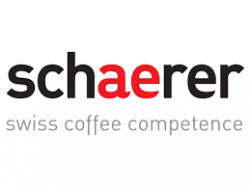 Still at the forefront today, Schaerer is offering its 7th generation of fully automatic espresso machines.